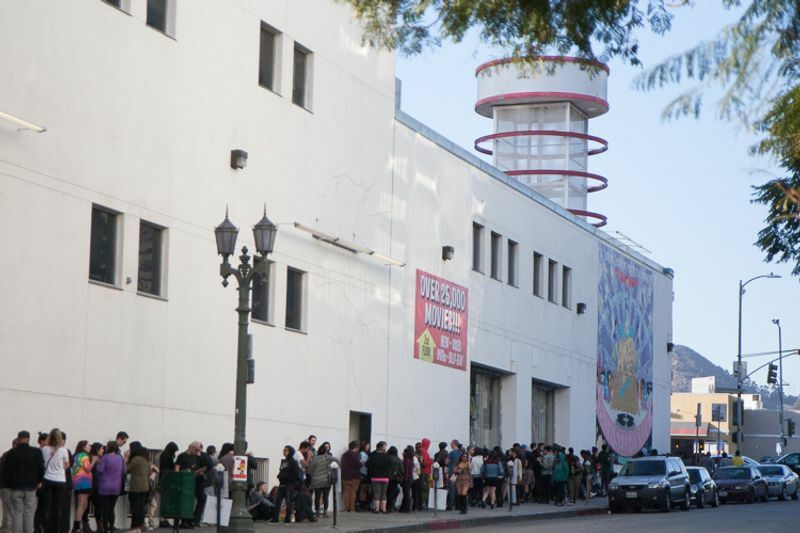 A line stretched around the block Feb. 19 to see Sky Ferreira play at Amoeba Hollywood. Walking out looking like some starlet from a Gregg Araki movie in a leather jacket, plaid schoolgirl skirt, sunglasses and a goofy cap, Ferreira exuded oddball, outsider charm as she lauched into a handfull of tracks from her excellent debut album, Night Time, My Time. She started with the Janet Jackson-meets-Zola Jesus style "24 Hours," a highlight of the album that perfectly captures her melancholy, hedonistic youth aesthetic. Following was "Ain't Your Right," with its gender-bending lyrics and industrial beat. "You're Not the One" let Ferreira show off her smoky, soaring vocals. 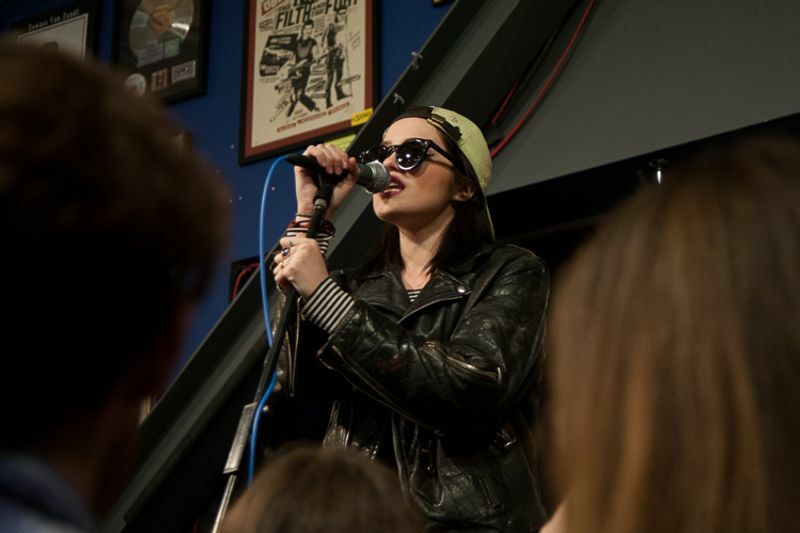 Ferreira looked like she was having a great time, giggling and throwing a water bottle into the crowd, and decided to stay for one more song, pulling out a surprise with early breakthrough single "Everything Is Embarrassing," from the Ghost EP. For those of us who didn't get to see her open for Miley Cyrus, the show felt like a special treat, a glimpse of an emerging talent on the verge of exploding. Well, here we are. We weren't thrust into a new dark age oblivion, the world didn't end and neither did my workaday quest for the best music for the day. This year was rife with records that just had to be snatched -- reissues, compilations, and a fair few newbies too. Here follows my personal, "show and tell" style best-of list for 2012: the year that didn't stop the big wheel a-turnin'. Rather than just dicing up a list of cold-cut favorites, I've included personal events and trends herein that shaped the music I sought and gravitated towards within the past year. BEST NEW ALBUM OF THE YEAR: Jessica Pratt - JP. No contest. I have naught but the best of things to say about this disc of spun gold and I'm not alone. It seems every Barry, Rob, and Maurice in the blogosphere has been falling all over this record like autumn leaves in the rain. If you really want to know my take check out my real talk review of JP here, otherwise please do enjoy the album's opening track, "Night Faces" below. BEST 2012 REISSUE: It's a tie between two (Numero related) comps: WTNG 89.9FM: Solid Bronze and & Personal Space: Electronic Soul 1974 - 1984. Both platters piled high with private press oddments and rarities one could hardly go more wrong than to miss out on these two exemplary feats of the compilation arts. 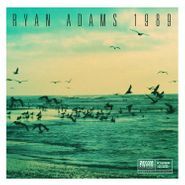 The former being a point of revision for many in that it is essentially a mix of largely unheard "yacht rock"/AOR triumphs of seventies song-writing sensibilities (man, is it ever sensibly sensitive) that confronts one's moral definition of guilty (listening) pleasures. The latter comp, Personal Space - a seemingly dark horse among the usual reissue fare fleshing out the the soul comps shelf space, made the rounds among Amoeba staff regularly thus enjoyed a healthy amount of in-store play as well. Chock full of rhythm-box workouts a la Sly Stone, Timmy Thomas and Shuggie Otis, it's a far-out soul/funk excavation of the highest order. Both of these are solid front-to-back listens for the home vinyl library/curio corner.